Business owners in the Phoenix area are familiar with their annual Backflow test requirements. A letter comes from the city each year informing you that it is time for your annual inspection, and if you don’t comply, the city will come out and shut off your water. This annual report is not fun, and business owners usually groan that it is that time of year again, kind of like getting a dental checkup. Backflow prevention is incredibly important, and it is taken very seriously by the City of Phoenix and the other surrounding cities, including the City of Tempe, City of Scottsdale, City of Glendale, and the City of Mesa. 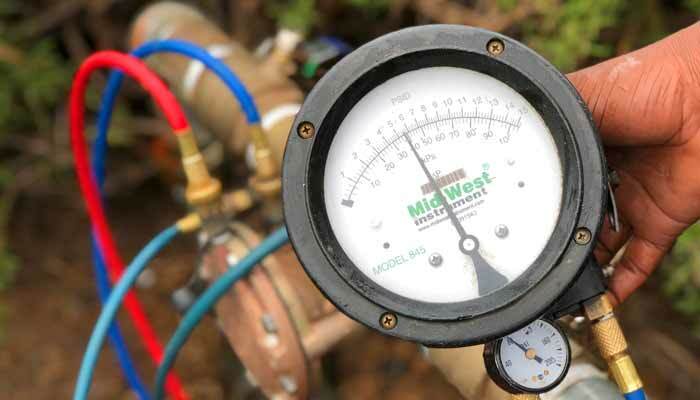 To be a certified backflow tester approved by the City of Phoenix and other cities in the metropolitan area you have to go through a week-long qualification course and pass a proctored exam. This is not a one-time test; a certified backflow tester must pass the exam and recertify every three years. The equipment that is used to test backflows has to be calibrated and tested annually for accuracy. The certification for both the backflow tester and the equipment are filed with the city backflow department to ensure that those testing and qualifying backflows are certified backflow prevention assembly testers. Why is it such a big deal to test a backflow? Believe it or not, the city did not make this annual inspection up just to hit your bottom line and reduce cash flow. Backflow testing ensures the safety of our drinking water. Without backflow devices our domestic water lines could be contaminated with chemicals, you can imagine what that would do. If all of our faucets poured out water with weed killer in it and pesticides, we would all wish that a properly working backflow had been installed on the water line that contaminated the system. For decades backflow assemblies have been tested by certified professionals with annual licensing and testing requirements. What has not been a requirement until July of 2018 is the repairs of failed backflow preventers. The 2018 Uniform Plumbing Code just made it a requirement that all backflows requiring repair will be required to be repaired by a licensed backflow repair specialist. UPC Section 603.2 Approval of Devices or Assemblies states: Testing or maintenance shall be performed by a certified backflow assembly tester or repairer in accordance with ASSE series 5000 or otherwise approved by the Authority Having Jurisdiction. IPC Section 312.10.2 has also been amended to read: Testing or maintenance shall be performed by a certified backflow assembly tester or repairer in accordance with ASSE Series 5000 or otherwise approved by the Authority Having Jurisdiction. Robins Plumbing, Inc is on board with this new code requirement and while it means more paperwork and certification classes for our team we know that this is a change for the better. Backflow devices protect the health of our entire community; they should be installed, tested, and repaired by certified professionals. You can trust Robins Plumbing to take the health and wellness of our community seriously by complying with the new Uniform Plumbing Code.